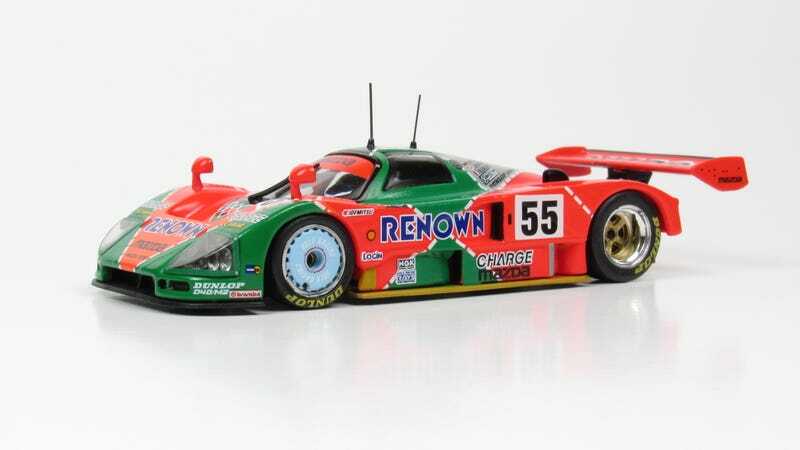 This is a 1/43 scale IXO Mazda 787B, winner of the 1991 24 Hours of Le Mans. This is my favorite car to ever run at Le Mans and it’s historically significant for a couple of reasons- currently, it’s the only Japanese car to ever win the race overall and it’s the only car to win that did not have a traditional piston engine. While the 2.6L quad rotor motor remains unique in Le Mans history, this year, another Japanese team is likely to finally win. The car was driven by Volker Weidler, Johnny Herbert, and Bertrand Gachot. It didn’t have the pace of the other factory entries that year, only qualifying 12th, but proved to be reliable enough as factory entries from Jaguar, Mercedes, and Peugeot all had problems throughout the race. Helping cement this car in the memories of Le Mans fans is this striking Renown livery. Renown is a Japanese clothing company, so it makes some sense for the car to have such a fantastic livery.